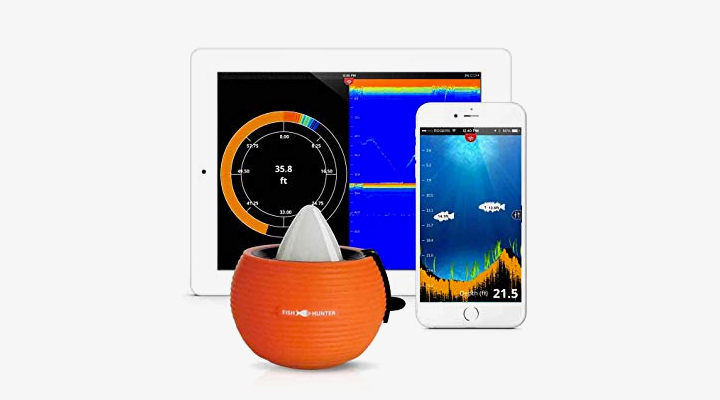 FishHunter Military Grade Portable Fish Finder 3.0 is a portable, castable device that comes with an application for your iOS or Android tablet and phone with some impressive features. This remarkable fish finder is convenient, powerful, and is bound to attract the attention of fishermen (and women!) everywhere. Let’s take a closer look at this device. This baseball-size wireless castable sonar weighs 117.5 grams with a range of 82 feet (25 meters) uses Bluetooth to feed data to your tablet or phone. The portable fish finder operates at temperatures ranging from -22? F (-30?C) to 95?F (35?C). The depth range of this small device can reach up to 133 feet (41 meters), regardless of the type of water (fresh or salt). The range of the sonar is up to 150 feet (46 meters). The internal battery powers the working device for 8 hours; in standby mode, it keeps a charge for 40 hours, and the power level is conveniently indicated. The device provides information about the bottom structure and water temperature and even has night vision lighting. Visit FishHunter‘s website, where the company explains just how its sonar works and the advantages over similar devices. As the “3.0” suggests, Fish Hunter is dedicated to improving its products, and they continuously test their sonar (and those of the competitors) and report the results. Thus they have, for example, have managed to increase the depth range of their device by 13 feet (4 meters) since 2014. Straightforward marketing. There are no hidden costs with the FishHunter. All the necessary accessories, including the USB cable, charging station, car/boat charger, user?s guide and a special carrying bag are included in the package with the device itself. Still, you may want to pick up a couple extras, such as a nylon tether or a waterproof armband, or you can simply purchase the advanced FishHunter Directional 3D fish finder package. The device is protected by a rubberized outer casing, and there are no exterior seams for water to seep in. The transducer used by the device is said to have the highest frequency possible power currently available (381 kHz). The app deserves a closer look, since it is a crucial part of the FishHunter Military Grade Portable Fish Finder 3.0, and is designed to improve and upgrade your fishing experience to the maximum. View Modes. There are three view modes for your convenience: the “raw” mode that shows you the unanalyzed sonar data; the fish view modifies this data to give a realistic picture of what is underwater, and the ice fishing flasher view is optimized for ice fishing and tracks lure movement as well. The app offers a range of conveniences: for example, you can archive the data to share or drop a pin to save a location and your notes about it so that you can find your perfect fishing hole quickly and easily. Similarly, the app can record information about your catch (size, type, images) and the conditions (bait, time, weather, lunar cycle). according to the manufacturer, the Fish Hunter Military Grade is perfectly compatible with all iOS devices and Android tablets and smartphones. There is always some room for improvement. Note that this device is not a dual-frequency one! Also, while no cellular connection is needed for the work of the finder itself, a connection is necessary in order to pin locations. The device does not start working until it is in the water. This is understandable but can be the source of some confusion, so be sure to read the manual. The app is not exactly self-explanatory, though it does come with a built-in guide. You can also check out videos (FishHunter YouTube Channel, for example) that provide the basics and offer tips. Either way, it takes a little bit of study to get the most out of the FishHunter Military Grade Portable Fish Finder, but it’s worth the trouble. To sum up, when you visit the FishHunter Military Grade Portable Fish Finder 3.0 website, you may find yourself stunned by the device’s potential. Analysis by outside parties, such a Sport Fishing Magazine, on the other hand, may paint a somewhat different picture.